Design Squad Global clubs connect kids ages 10–13 from around the globe through after school sustainable engineering clubs! 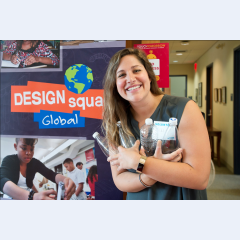 Design Squad Global clubs connect 10- to 13-year-olds in out-of-school programs around the world. In the Inventing Green Club, leaders will introduce kids to engineering and invention activities focused on environmental sustainability. You will guide club members through the engineering design process using the 6-week or 12-week Inventing Green Club Guide with weekly hands-on design challenges. You will also give kids a special opportunity: the chance to work with partner clubs from other countries! This experience helps them develop “global competence”—an openness to sharing, communicating, and learning from kids in another part of the world. Partner clubs will share photos and videos from the club sessions, giving participants the opportunity to provide feedback, ask questions, and share their final projects with one another. In the process they will discover their agency to make a difference in their communities and the world.